“Education opens many closed doors,” says Mohamed Maalim, 27, a bespectacled young Somali academic hero, a former student of Hagadera Secondary School who is remembered by many Dadaab residents for his sterling performance in the KCSE examination in 2011. He is now a Petroleum Systems Engineering graduate from the University of Regina in the Queen City of Regina, Canada.”It was not an easy journey,” he says with a radiant smile, proud that he had beaten all the odds to reach where he is today. Mohamed was born in Mogadishu, the capital of Somalia, on a fine Sunday evening in 1990, a year before the country fell onto its knees for a civil war that would last more than a quarter century, and when Somalia still lived in concord with its neighbouring states. Mohamed was not considered fit to pursue secular education until May 29, 2000 when he had completed learning the Quran and the Basic Principles of Islam under the tutelage of his father. However, Mogadishu was then in turmoil. Men were killed, women were raped and children were maimed by fierce warlords who had no respect for humanity. Homicide and the public property embezzlement were the order of the day. Sometimes there was a heavy shooting around the school and children were released from school. But life had to go on. Children still had to go to school.”My first day in school was very exciting,” he says. “That day I learnt the first four English alphabets: A-B-C-D.”Despite the problems at home and the war in the country, Mohamed showed a strong determination to learn. He initially struggled to study how to read and write Somali language from his mum Hawa, and later self-taught himself Arabic out of books he cheaply grabbed from the local book hawker. There was no one at home to help him with the homework. So, he had to be attentive in class in order to be ahead of the other children. A few months later, when he sat for his first examination, Mohamed was ranked top in his class – a position he held until he completed high school. hange its name to Al Shabaab, was fighting the warlords who ousted the Siad Barre regime in 1991. On April 15, 2006, Mohamed parted from his childhood friends and waved goodbye to the only city he had known, and the family fled to Kenya to embrace a future hidden in the horizons. The journey was terrible. They had to walk on foot for 1,500 km in a busy, lion-infested desert for 15 days until they arrived at Hagadera, one of the refugee camps that make up the Dadaab Complex in North Eastern Kenya. Life in the camp was equally hard. The family had to depend on little food that was provided by the United Nations World Food Programme. The temperatures in the camp would sometimes hit 40 degrees Celsius and the children were stricken by malaria, typhoid and other diseases, yet there was no medicine available. But there was free education in Dadaab and therefore Mohamed again had the opportunity to go to school. “I saw a bright light at the end of the dark tunnel,” he says. cation in Kenya does not recognise certificates from schools in Somalia, despite them having been signed by UNESCO. So, Mohamed had to start from Standard Seven; four years below his academic level. And another journey started. Mohamed started to lead his class although his new classmates were very bright, and the competition much stiffer than when he was back in Mogadishu. Halimo Saman, a fresh high school graduate and a primary school teacher, motivated Mohamed to work hard in school in order to get away from the hard refugee life. A year later, when he sat for the KCPE examination, Mohamed was the best student in the entire Dadaab region. He attained 394 marks out of the possible 500. “The then Education Minister, Prof George Saitoti, announced my name,” he says with a broad smile. Mohamed got a scholarship to study at Starehe Boys Centre in Nairobi. But there was unrest in the country following the 2007-08 post-election violence, and because of the insecurity, elders from Dadaab dropped his scholarship. Child to Child Tracking, School parent association trainings, Teacher training on child friendly school environment, Incorporation of ICT in education, Classroom rehabilitation and Water and Sanitation support. The programme works closely with key stakeholders such as the Ministry of Education, Teachers service commission, County Governments and Local Communities to ensure sustainability of supported measures. WTK is the implementing partner of SCORE project, a scholarship programme that is funded by the DD Puri Foundation. Through this programme,15 refugees from Kakuma and Dadaab Refugee Camps have been awarded tertiary scholarships in 2015 and 2016 to pursue Diploma courses. This courses offer hands-on training in Water Engineering, Information Technology and Nursing. Alumni of the DD Puri foundation currently stand at 22 bringing to a total of 37 the number of students supported since 2007. 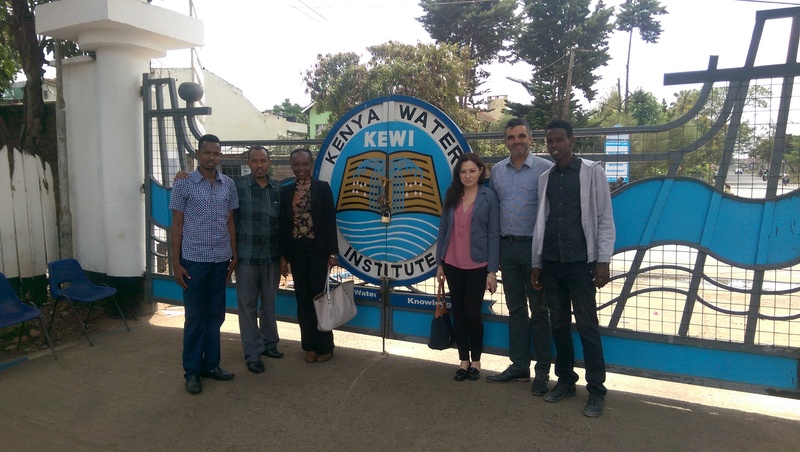 This month, WTK was greatly honored to host Vicrum Puri and his wife Rachel Puri on their visit to Kenya to assess the progress of the scholarship program. The activities involved a meeting with WTK executive Director-Dr. Marangu and the senior management team, visiting SCORE students in their respective institutions of learning and a field visit to Kakuma Refugee Camp. Discussions centered around future goals of the SCORE project in partnership with WTK, impact of the scholarship program, current status and emerging needs, meeting with relevant college /University heads for discussions on possible partnerships and getting insights from education specialists from WTK, UNHCR and GoK on the emerging trends and needs in education. The delegation also met with DD Puri Foundation alumni through whom the positive impact of the program has been felt. We are grateful to the DD Puri Foundation for the support they have accorded us and look forward to future partnerships. 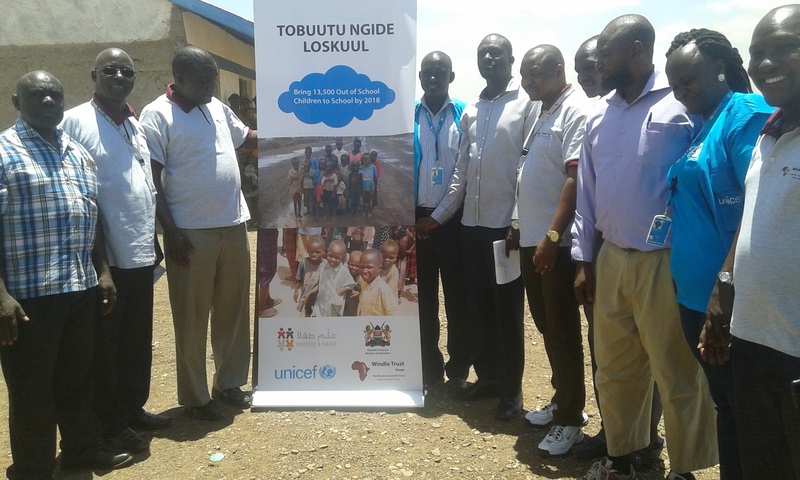 Inset: WTK Executive Director and head of UNICEF-Lodwar Office Mr. Phillip among other dignitaries in Launch of Return out of School Children to School (ROCS’s ) Project in Komudei Primary School Turknana County. According to statistics by Ministry of Education,58% of the Children in Turkana county are not in school due to underlying issues such as being engaged in taking care of animals for the boys and for the girl’s early Marriages after undergoing the traditional custom in Turkana known as Beading. However a sigh of relieve to the residents of Turkana North for the successful Launch of Return out of School Children to School (ROCS’s ) Project which was unveiled at Komudei Primary Yesterday (Tuesday 6th September). This occasion was graced by WTK Executive Director and head of UNICEF-Lodwar Office Mr. Phillip among other dignitaries. This project will bring back all the out of school children to school. The project is funded by UNICEF and by WTK. 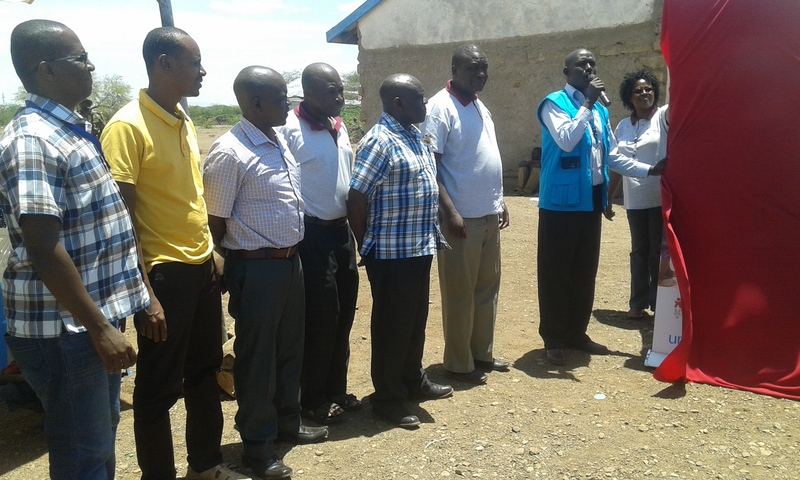 Inset:UNHCR dignitaries ,WTK Executive Director and head of UNICEF-Lodwar Office Mr. Phillip among other personnel in Launch of Return out of School Children to School (ROCS’s ) Project in Komudei Primary School Turknana County. Even as they face repatriation Kakuma and Dadaab refugee communities are transiting to a new school model that has helped them double student intake without additional strain on teachers, furniture and classroom space. Vision Secondary School in Kakuma and Waberi and Hagadera Secondary Schools in Dadaab have already adapted the model described as ‘breakthrough’ because it gives marginalized children opportunity to attend school without burdening parents with costs and hustles of putting up new buildings. Dubbed ‘Two-in-One’, the model entails running two independent schools within premises and facilities meant for one. One school reports in the morning while the other comes in the afternoon. Each school hires its own set of teachers and other personnel an actiity going on as the government of Kenya plans to close Daadab refuggee camp, the home of over 400,000 stateless people following concerns that terrorists have infiltrated the camp. The model which attests to the creativity inherent in collective actioncamein the wake of a crisis to Form One admission following improved performance in KCPE 2015 and increased enrolment which saw over 2,700 qualified KCPE leavers missing admission to Form One in Kakuma and Dadaab. ‘The crisis left the Refugee parents with no alternative but to run two schools in one,’ says Hagadera Secondary School PTA chair Mohamed Yusuf. Unlike the multi shift system which doubles the number of students but over-burdens teachers, UNHCR financed the implementation of ‘Two-in-One’in Kakuma and Dadaab including hiring new set of teachers and other personnel for each school – Vision Secondary Schools A and B, Waberi and Hagadera secondary. The first school reports at 6.30 am and until 12.30 when students and teachers vacate the premises giving room to students, teachers and support staff of the other school which runs from 12.30 to 6.30pm. Mooted by Windle Trust Kenya, an NGO that manages education in the Refugee camps and supported by UNHCR,the model has been positively received with enthusiasm.Vision Secondary School A and Vision Secondary School B communities introducing different uniforms, programs, examinationsand hiring deputy principal for each school. The model implemented under supervision of the Ministry of Education maintains the prescribed student – teacher contact duration by allocating five hour curriculum instruction and two co curricular engagements during every single school under teacher: student ratio of 1:40. The Education Officer in Hagadera ,Jennifer Katiwa, says the model has benefited many ‘learners who also have to find time to work as watchmen, bodaboda riders and hawkers given their precarious financial situation’. ‘It is the only option the communities have, given there are 21 primary schools in Kakuma and only five secondary schools’, she says adding that the communities lack land or money to put up new school. ‘Time is a resource given to all humanity in equal amount of 24 hours a day in which Africa enjoys 12 hours of daylight,’ he says pointing out that the refugee community who lacked money, land as well as corporate and individual philanthropy innovatively singled out time as a resource to maximize onto beat the form one admission crisis. ‘We have admitted 967 Students in form one while we would only have admitted 504,had we remained one School. We will increase the number to 1,004 in second and third terms,’ says George Nandy the Chief Principal of Vision Secondary School A and B.
Joel Ndingi,one of the Program Managers in Windle Trust Kenya says, “In Kakuma, a total of 2,394(518 Female) students were enrolled in Form One in the camp,which represents 60 per cent rise,enabled by the Two-in-One model”.Hagadera and Waberi secondary schools in Dadaab also reported over 50 per cent rise in school population, with 42 per cent increase in the number of girls, which the UNHCR Community Services Officer Katie Ogwang’ lauds noting that most Refugees are desperate to get education ‘especially Kenyan Education’. Nandy says teachers have enough time to attend to their personal interests ‘therefore fewer excuses for absenteeism’. Students say the system allows them plenty of hours to do homework after school. ‘It creates a sense of urgency in dealing with school work’, noted a student. ‘Remaining in school the whole day creates room for me to keep postponing and delaying action because the tendency is to perceive the day as timeless,’ adds the student. Girls also are able to attend school without disruption because they have an entire morning or afternoon they could allocate for household chores, according to teachers. I just graduated this month (April 2016) with a degree in Actuarial & Financial Mathematics from McMaster University. Isn’t that exciting? Yes, it is! At least to me. A few years back, holding a university degree was just but a dream for me. And now it is a reality. That is why I decided to write this thank you note to the organizations that made it possible for me to get to this point. I hereby express my heartfelt gratitude to World University Service of Canada (WUSC) and Windle Trust Kenya (WTK) for the rare chance that was granted to me to pursue higher education at McMaster University. The two organizations, their benefactors, their partners and many individuals who work either as their employees or volunteers have made many dreams possible. Mine just happens to be one of these many dreams and I am very thankful for that. This note would be incomplete without thanking McMaster University and its Student Refugee Program (SRP), who ensured that I transitioned into the university life and a new life in Canada with minimal difficulties. I salute the young women and men, who generously volunteered their time, effort, and intellect at the McMaster University Local Committee. In spite of the highly demanding academic commitments that they had, they still made it their responsibility to ensure that the sponsored students were alright as they settle into the university life. In addition, there are thousands of students who contributed to support the sponsored students financially. I may never know many of them, but their generosity is eternally appreciated. I happened to stumble upon the story of Dr. Hugh A. Pilkington, who made a huge personal and selfless effort so that disadvantaged youth could have access to education. I must say that it is one touching story, given how he tragically died while trying to follow what he strongly believed in. 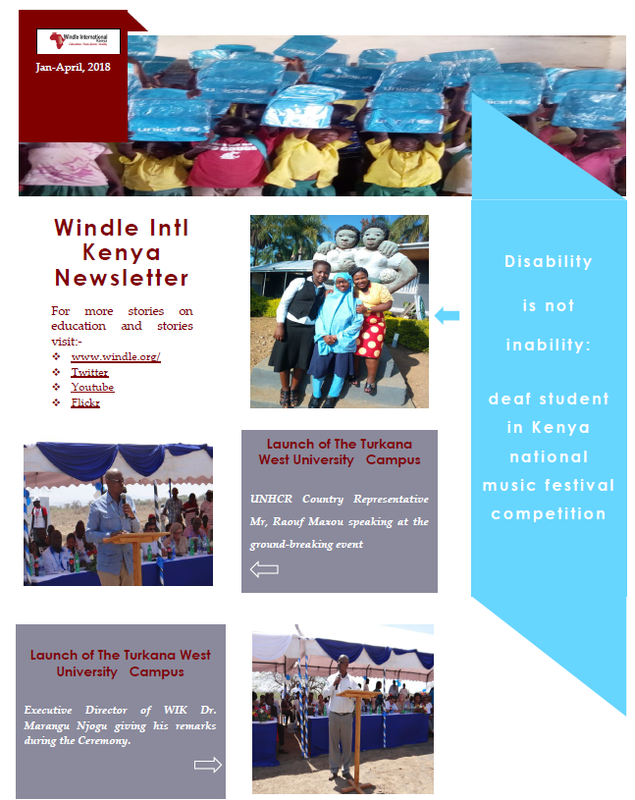 It is great that his name lives on through Windle Trust Kenya (WTK), and all the other Windle Trust offices in different parts of the world. The idea that education changes societies for the better is not something abstract but a reality of our world and having organizations such as WUSC, Windle Trust and their partners, whose activities revolve around this idea is not something to be taken for granted. What they do goes a long way and I, as a recent graduate from McMaster University, stand as a testament to that. I say, once again, Thank you! And keep on changing the world, one disadvantaged youth at a time. On Friday March 4th, the team participated in the launch of the MMUST Kakuma Campus and the presentation ceremony for the award of Diploma certificates to 89 graduands at the Kakuma Peace Centre. 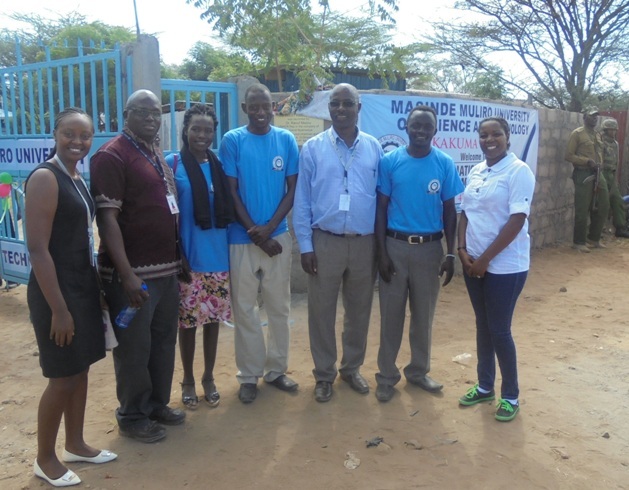 The occasion was attended by, among others, the chair of the MMUST Council and Pro-Chancellor, Vice Chancellor and other senior university staff, a representative of Turkana Governor’s office, UNHCR Kenya Representative, Kakuma UNHCR Head of Sub-Office and UNHCR staff, LWF staff team. 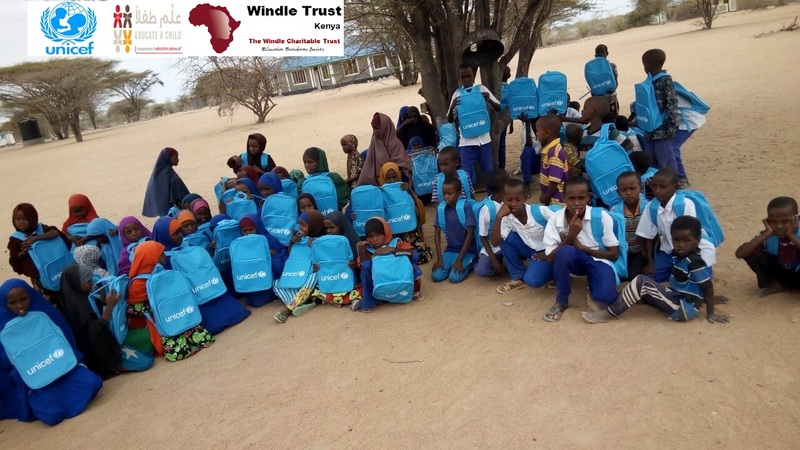 Windle Trust team was led by the Executive Director, Dr. Marangu, Finance and Administrative manager Phyllis Mureu, Kakuma manager Raphael Sungu, DAFI project staff and other staff from WTK Kakuma. Find more stories in our monthly Newsletter . In celebrating the international women’s day on 8th March 2016 and aligning to the theme “Pledge for parity”, Dadaab team decided to celebrate it differently by organizing a mentorship program for 20 girls’s at Karatina University, Nyeri County on 9th March 2016. Thanks to the existing MOU between WTK and Karatina University. The education excursion gave the girl’s an opportunity to nurture a sense of direction and motivation to attain a postsecondary education and training to girls. Further, the girl’s were exposed to new learning experiences that broadened their career awareness and helped in defining clear academic and career goals. 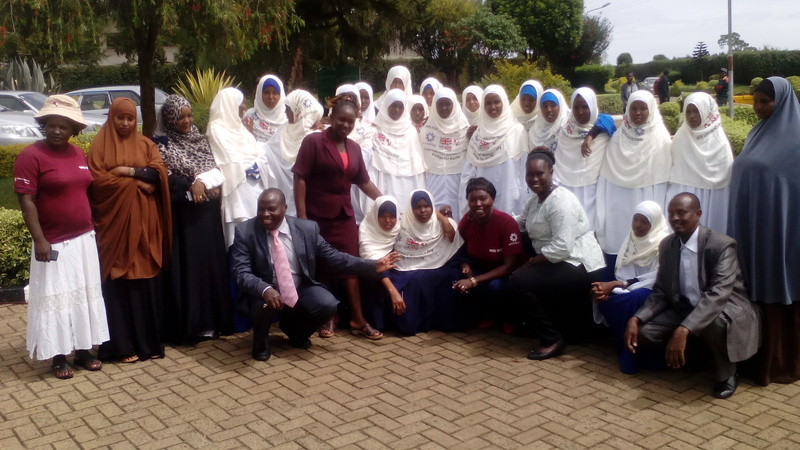 The two day educational trip gave the girl’s a chance to interact with other girls at a top National school- Bishop Gatimu Ngandu girls high school to benchmark themselves in academics and get a chance to meet with University students. Within the University the girls’ got a chance to view exhibitions and innovations spearheaded by female students in Science and Engineering Department. The Female University students encouraged the girls to excel in science related careers and go against the odds in the society. Garissa County is inherent of some of the rich cultural practices of the residents in the region. 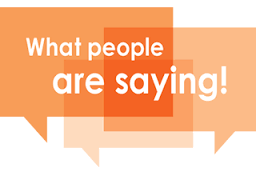 However there are some negative cultural practices that are a drawback to development efforts. Early and forced marriages of the girl child deny the young population opportunities to advance in education. KEEP project with the support from DFID has transformed the thinking patterns among Garissa residents particularly girl’s, parents, school stakeholders at Dertu Secondary school. Through a series of sensitization on the change of girl’s attitude towards early and forced marriages the enrolment of girl’s has increased immensely and girls have embraced education. In the 2015 KCSE results Dertu girl’s Secondary School managed to produce the top girl in the county. From the dusty and remote village, to poorly staffed school located 100 kilometres from Garissa Town Ms Leila Yusuf emerged the top girl the county. Leila scored a B+ of 67 points emerging one of the best performers in the region from public schools attributing her success to hard work.